See rebuttal to this article here. STOYSTOWN, Pa. -- It was a remarkable shot that produced a one-of-a-kind image: a green pasture, red barns in the distance and, against a brilliant blue and cloudless sky, a lone mushroom cloud of dark gray smoke. Taken the morning of Sept. 11, 2001, seconds after United Airlines Flight 93 plunged into a nearby field, the eerie photo was, and still is, according to the FBI, the closest thing it's got to an image of the crash itself. Val McClatchey snapped the single picture with her new digital camera. The wife and mother had been sitting on the edge of her sofa, clutching her second cup of coffee and watching the smoking towers of the World Trade Center on TV, when she heard the sudden surge of a plane engine, followed by a violent, house-shaking boom. Mrs. McClatchey grabbed the camera and ran onto the front porch of her house along Indian Lake. "I didn't even aim. I was just like, 'Oh, my God,' " she said. She dropped the camera, jolting the battery loose, then tried in vain to call her husband, son and daughter. She had no idea what she'd captured until the state police put a call out to people in the area, asking for photos, debris and other evidence. She took a printout of her photo to the police, she said, and, within an hour, FBI agents were at her house. Once the full, national scope of the Sept. 11, 2001 attacks had settled in, word spread quickly of Mrs. McClatchey's photograph, and soon, everyone wanted to buy a copy. "But it's not something that felt right," she said. She copyrighted her photo and gave it a title, "End of Serenity." This would later prove an apt description of what was in store for Mrs. McClatchey, 50. She would find herself the target of 9/11 conspiracy theorists and involved in a copyright lawsuit against The Associated Press. "Right now, it's become more of a curse than a blessing that I took it at all," she said. During the next few years, the photo would appear in magazines and newspapers, from Newsweek to the Pittsburgh Post-Gazette, with Mrs. McClatchey's permission. It became part of a fund-raising brochure for the Flight 93 Memorial Fund. Copies are available upon request, with proceeds going to the charity Heroic Choices, formerly the Todd Beamer Foundation. Mrs. McClatchey's photo was included in the Smithsonian Institution's traveling exhibit, "Bearing Witness." And her personal story appears to fit seamlessly into the larger narrative of the Shanksvsille crash site and temporary memorial, when, dozens of times a day, volunteers such as Donna Schmucker tell Mrs. McClatchey's story and other witness accounts to the visitors who stream onto the site, holding up her photo in the laminated pocket of a binder for all to see. But Mrs. McClatchey's fame has recently taken a sour turn. The real estate agent has recently become a target of bloggers calling themselves "9-11 researchers," who are seeking to prove that the U.S. government was complicit in the attacks that brought down the Twin Towers, pierced the Pentagon and crashed United Airlines Flight 93. "The End of Serenity" has turned out to be their smoking gun. The smoke plume doesn't line up right, they say. It is too large in the frame. The smoke is characteristic of an ordnance blast, not a jet fuel fire, further evidence that the government shot down Flight 93. They analyze wind direction, debris patterns and camera trajectories, all in the service of the theory that the crash was faked. They have visited Mrs. McClatchey's office and called her at home, posting satellite maps of her property and accusing her of digitally altering her photo to insert a fake smoke plume. The bloggers have picked apart her story, highlighting inconsistencies in different news accounts and questioning her motives. Others have described her as "surly," "hostile," "irate" and "defensive." People have called her at home, accusing her of being anti-American and of "holding the photo hostage." On a simple Google search, Mrs. McClatchey's name now pops up in the same sentence as "total fraud." "Val McClatchey has made it unmistakably clear to us that she intends to milk her 9-11 claim to fame for all it's worth, truth be damned," writes Lisa Guliani, of WingTV (World Independent News Group), who traveled to Stoystown to interview Mrs. McClatchey. "If the smoke plume was photo-shopped on there, then that could mean either that the photo was simply a fraud by Val, or it was a fraud by her and the FBI and/or other government agents since she did mention that the FBI did inspect the memory card from her camera," writes a blogger identified as Killtown. Mrs. McClatchey was taken aback by the personal criticism by those who, she said, "hide behind their aliases." "This Killtown, whoever he may be, I find it very disturbing that this is a 16-page attack on me personally," said Mrs. McClatchey, who opened her real estate company a year and a half ago. "My business is named. That hurts me personally. It's pretty disturbing. My whole life is out there, a map to where I live, a map to my office. It's a safety issue for me. There's some crazy people out there." About Mrs. McClatchey's "End of Serenity," Killtown concludes that either the smoke plume in the photo came from a bomb blast closer to her house, or that the picture was faked by Mrs. McClatchey or the FBI. Killtown writes: "If the first is true, then Val may be off the hook. If any of the latter two are the case, then Val, you got some splainin' to do!" He then proceeds to post her home address, phone number and personal e-mail information. Mrs. McClatchey acknowledged that a lot of people are alleging she fabricated the photo, but she stands by its authenticity. Days after Sept. 11, neighbors saw the image, still in her camera. The camera and computer were new, and she didn't have access to Photoshop or any other photo-altering software. "I know that photo is completely legitimate," Mrs. McClatchey said. "Other people saw the same thing I saw." Special agent Jeff Killeen, of the FBI in Pittsburgh, confirmed that the photo of the barns and the smoke plume was "a very legitimate photograph." "We consider that a photo that was taken moments after Flight 93 crashed to the ground," Mr. Killeen said. "It's a remarkable shot. It's remarkable that someone had the wherewithal to snap a photo of the crash. This is a one-of-a-kind. We really don't know of anything else." The photo is even more surprising considering the sparsely populated area around the crash site, Mr. Killeen said. He compared "End of Serenity" to a hypothetical photo of the first bombs hitting Pearl Harbor, or a still image of one of the commercial jetliners in mid-collision with the twin towers. As for the 9/11 conspiracy theorists, Mr. Killeen said, "They can debunk all they want." On Sept. 11, he was at the site shortly after the crash, and knows the amount of debris and other evidence that was gathered from the scene but was never made public. Officials did look into the possibility that Flight 93 was shot down, he said, "but there's no evidence to suggest that whatsoever. None." Mrs. McClatchey still occasionally gets requests for copies of "End of Serenity." She prints them out on her personal printer, and says she has no idea how many hundreds or thousands of dollars the photo has raised for the Heroic Choices charity. She operates on the honor system, she says, and simply forwards the checks to them. Representatives from the charity did not return calls requesting comment. Mrs. McClatchey has begun accepting some money, on account of her copyright action against The Associated Press, which, she says, distributed her photo without her permission. "So here I am, in the middle of this nasty lawsuit," she said. "I have kept some of the money, because now I have some legal fees. It's very unfortunate, because I was trying to do the right thing." David Tomlin, assistant general counsel with The Associated Press, confirmed that litigation was in progress. "To the extent that we distributed her picture, we assert we had permission to do so," Mr. Tomlin said. "We deny infringing on her copyright." Across the country road from Mrs. McClatchey's home is a fenced-in pasture with red barns under a bright blue sky, the same scene from "End of Serenity." Given the headaches of a lawsuit and the blunt personal criticism from the bloggers, Mrs. McClatchey wonders if her quick decision to grab her camera that morning nearly five years ago and capture the last puff smoke that was Flight 93 was the right one. But she is glad to be able to give something back to the families of the dead, and thinks her photo will stand the test of time and conspiracy theorists. "The truth speaks for itself," she said. 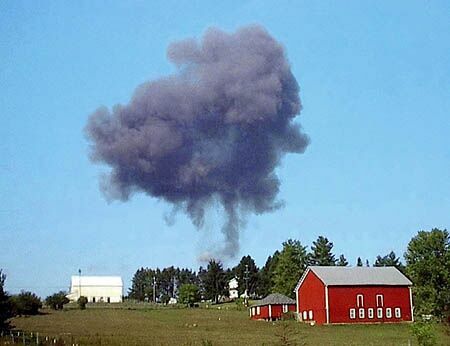 Top photo: This image of the smoke cloud left by United Airlines Flight 93 after it crashed into a field in Somerset County on Sept. 11, 2001, was taken by Val McClatchey from the porch of her home. 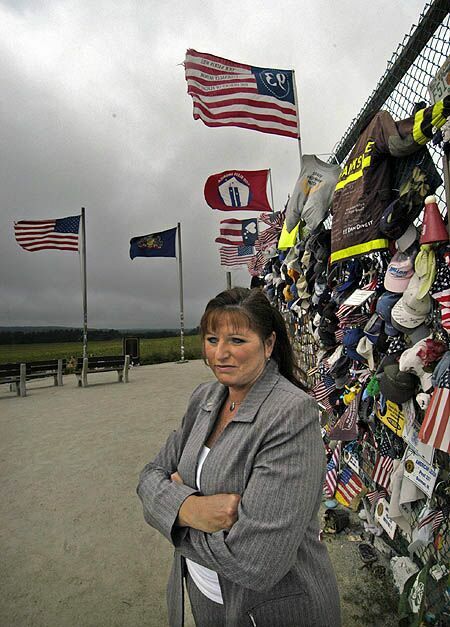 Bottom photo: Val McClatchey looking over the Flight 93 Memorial site which she had not been to since November 2005.